Press play and forget about buffering with the Archer C9 (Certified Refurbished). The Wireless AC router creates high-speed dual-band Wi-Fi speeds up to 1900 Mbps and increases total throughput up to 430% faster. Now, you can stream in 4K and game online without interruption on your Xbox, PlayStation, PC or Mac. Plus, the router's powerful 1 GHz dual-core processor keeps your network running at blazing speeds even when many devices are online at the same time. Enjoy reliable Wi-Fi across your home thanks to the Archer C9's three high-performance dual-band antennas and Beamforming technology, which strengthens Wi-Fi connections. The Archer C9 also lets you assign priority to your favorite online activities through QoS, so you never have to worry about lag when you're gaming and streaming. 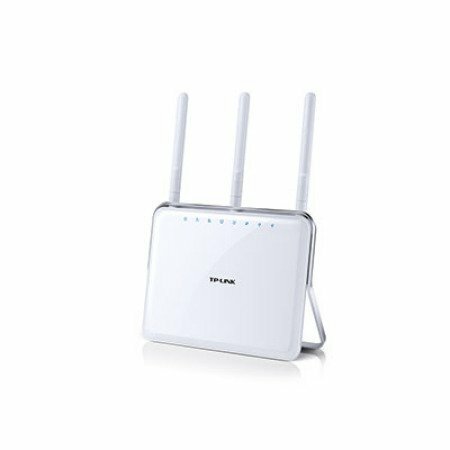 Essential Home WiFi Router - AC1900 Whole Home Coverage Wireless WiFi Router This AC1900 wifi router is best for a connected home. Whether you have smart home products, 4k streaming, online video gaming, or the whole family's smartphones, the Archer C9 is engineered for fast and reliable wifi for the entire home. The 1GHz dual-core processor will ensure that your media streaming will not buffer if someone else is downloading a 4K movie in another room. Perhaps you have simultaneous devices connected taking up bandwidth, the beamforming technology will laser-focus your wireless signal to where you need it most. Superior wifi bandwidth utilization increases wifi range, delivering highly targeted and efficient wireless connections. Never more will you need to miss that climatic action scene, or booted out of a gaming server. TP-Link's AC1900 wireless router is the solution for your home network.